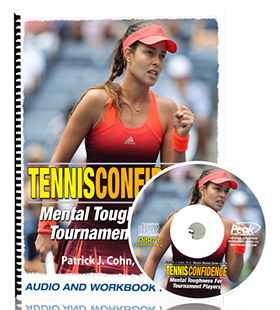 Do you play tennis with a ton of confidence in practice, but have trouble taking your practice game to matches? If so, you are not alone. What does it mean to play with trust? When you play with trust, you allow yourself to play freely – you have faith in your practice. You don’t grind on your technique or over coach yourself in matches because you are confident that you can rely on your practice. You just react to the ball, knowing your training will carry you. Through practice and repetition – a lot of it – your body learns how to hit shots effortlessly, instinctively. Meaning with enough repetition and practice, you can hit shots without thinking about how to hit shots. You should think of competition as a “closed book test” to use a schoolwork analogy. You’ve studied (practiced) for the test. In competition, it’s time to trust what you studied. How does your trust break down all of a sudden when you play in a match? 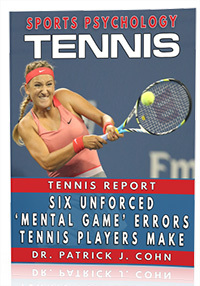 Many mental game or tennis issues can affect your level of trust in matches. A lack of confidence and cause your trust to not show up. Indecision is another barrier to trust. Fear of failure can kill the soundest strokes. Perfectionism can cause you to focus too much on perfect strokes and not enough on strategy and playing smart shots. What can players do to improve their trust in matches? Tennis psychology and trust starts with having a balance in your practice routines. Practicing the right way will help you improve your trust in matches. The key is to practice like you compete. You’ll want to replicate tournament situations. You might play more practice matches or tiebreakers. Any drill to help you react in practice will help you in matches. Use drills that force you to work on your footwork or mix up shots. You should practice varying the direction, speed and placement of your shots. Don’t analyze your mistakes during a match – save it for after the match. When you analyze your mistakes, you begin to over coach yourself. You won’t fix what’s broken during the match. Fixing only leads to over analysis or defensive play.